We believe in co-creation and having the best man at each post. Therefore we rely on network partners with whom we have done business with previously or have screened to be reliable, serious business partners and who share Griffin People’s vision and concept of quality. At Griffin People we are each experts within our field, but also recognise that no-one is an expert in everything. For this reason we have formed a network of reliable network partners. In this way we can maintain a global vision, but with strong local roots. Our local business partners maintain close contact with local decision makers in the private and public sectors. They have the necessary cultural understanding and understand the political landscape in which your project is to succeed. Market intelligence and an understanding of the tactical and operational matters are essential for the successful set-up of any project. Country partners – primarily have detailed understanding of the local conditions – from the supply of energy to the political landscape in their home country. Associated partners – range from subject matter experts to local project partners and system suppliers. Their role varies from project to project, but they would typically also assist in the creation of the master plan. Industry partners – typically suppliers of the technology selected for the project at hand. We pride ourselves on acting independent from any supplier and will handpick the best solution from the right provider of system, energy or service necessary for the successful setting up and operation. Solution partners – to ensure the most cost-effective, yet high quality process when it comes to the construction of the plant or system, we select the right team of solution partners. Solution partners may have an active role in e.g. feasibility studies or may provide know-how, local service, supervision and labour. 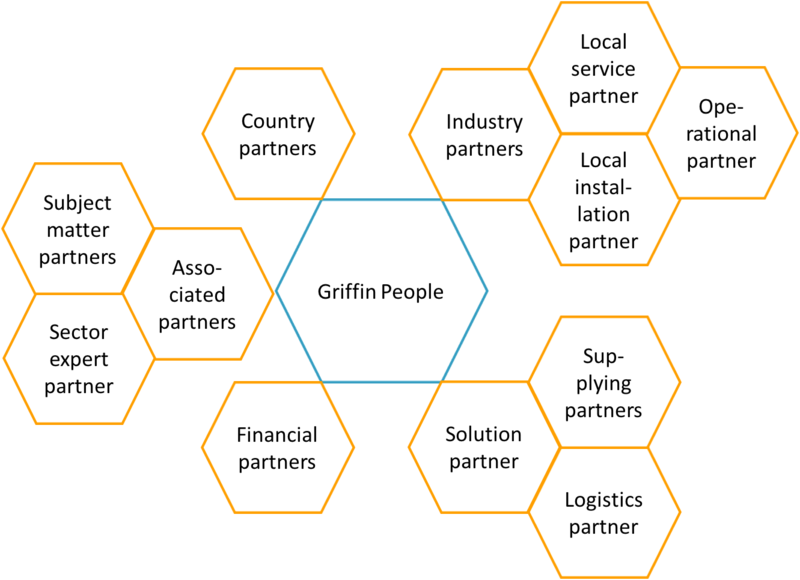 Depending on the project, Griffin People will set up a project group consisting of relevant partners, each a specialist within their field.